"Obstacles are put in our way to see if what we want is really worth fighting for." I thought maybe it was time for an update seeing as it's been almost a month. I was going to wait until next Thursday as that's when I have my next Hospital appointment but I have a few things to write about anyway, so why not do it now! I'll start with speech therapy. I've been twice, I have missed two appointments because of not being able to get to the Hospital, my next appointment isn't until the 10th July. It's going really well though, I am able to use my voice all of the time now, it's still not very loud and it's quite 'breathy' but I'm just glad I have my voice back. It goes a bit when I get tired because I have to put in a bit of effort to get it to come out properly as only one of my vocal chords is working properly at the moment...so I guess (and I'm hoping) it'll improve as time goes by. I have exercises to do which I make sure I do little and often, I also inhale steam sometimes because it's meant to help and I also sip water. I keep wanting to clear my throat but I was told not to do it so I have to sip water instead! When I speak it's just in one tone, meaning when I am excited about something it doesn't sound like it! lol. Hilary (my speech therapist) phoned me yesterday and she mentioned how she can hear a different tone in my voice which is great and means it's definitely improving!! She's not free until the 10th of July but she said that works out well because next week Mr Pace can look at my vocal chords and see what they're doing when I'm talking and then he can report back to her and we can go from there. I've been feeling well, not that I've ever actually felt ill! 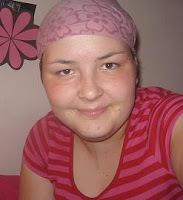 (Apart from my first 3 lots of chemo) - quite tired lately though. Maybe the tiredness side effect kicked in a bit delayed! Last week and the week before I was really tired, I couldn't really be bothered to do anything but this week I'm feeling a bit more awake which is good. I thought after doing the Race For Life on Sunday would knock me out for days but it didn't and I didn't even ache afterwards!!!!! 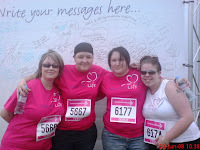 So, we did the Race For Life on Sunday (22nd June) - it went really well. I was a bit worried I'd collapse because I'm so unfit, but I didn't. Phew! I was told it took me 40 minutes. I walked all of it...didn't want to push myself too much! It was a really nice day, quite hot actually and I got a bit of sunburn on my face (oops)...when we left in the morning it was freezing so I didn't even think it would warm up. I loved the little goodie bag I got afterwards, the medal too! Here's a picture of my Mum, me and my friends, Vix and Jodie on the day. Thank you girls for doing it with me!! I'm doing the Mouth Cancer Awareness walk in September. This time it's 10k, it's in Hyde Park in London. I'm quite looking foward to it, I'll get to meet a few people who I've met through my blog which will be great. It's exciting! I have a little 'sponsor me' box over on the right hand side of my blog. I have plenty of time to get sponsors though and I'm trying to think of fundraising ideas we could do. I want to say thank you to those who sponsored me for the Race For Life by the way, I managed to raise £200 which I thought was brilliant! Hmm...not sure if I have much else to say. I'm not going to post any more pictures of my neck because it seems to be staying exactly the same, any ideas how long it will look like this for? My hair is growing, growing, growing...just waiting for it to get a little bit longer so I can actually do something with it. I have been out a few times without my bandana on but I still wear it sometimes. It's so weird not wearing one, I will eventually stop wearing one. Just not yet!! I have my monthly Hospital appointment on Thursday (3rd July) - I'll ask then when my scan will be. Hopefully it'll be in July sometime. That's what Dr Tahir used to tell me all the time. You did great on the walk for Race for Life - I enjoyed walking with you - even though it turned out quite hot (and I don't like hot lol) it was a lovely experience. Roll on the next one (eek). Yay! You're blogging again Hayley! Bloody well done on the Race for Life and to raise so much for the cause too. You're a true star! So much so, that if you visit my blog you can collect your award that I've got for you. I'll have to sort the notebook out now for those who sponsored you and left me a message too.